Enjoy all the benefits of solar energy - a guaranteed return and image boost - without the initial capital investment. 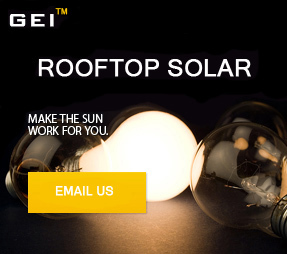 Lease your roof areas with GEI as a professional business partner. Higher return of property through idle rooftop potential. Secure, environmentally friendly source of revenue through a long-term lease. Image benefits even without your own investment. Mounting and construction of the turnkey solar power plant by an internationally recognized contractor. No risks: Maintenance and monitoring of the solar power plant by the investor. Leasing of roof areas for up to 20 years. Lease payment will be made monthly, yearly or as a lump sum (discounted) on the commissioning date of the solar power plant. GEI identifies suitable investors and takes care of the planning, installation, and operation of the solar power plant. GEI also negotiates the agreements related to the monitoring and maintenance of the solar power plant. Size: Flat roofs from 5,000 m² (approx. 260 kWp). Gabled roofs from 1,500 m² (approx. 150 kWp). Structural Conditions: Good technical conditions (regarding the next 20 years). Static conditions (normally sufficient) and existing mounting facilities. Other: Alignment of the roof areas - south alignment in case of gabled roofs. Shading - as little as possible. Minimum lease of at least 10 years. Complete site plan, roof plan, ground plan. Access to the roof areas. Space for the inverter and meter. Evaluation of the suitability of the roof areas regarding structural and legal requirements. Arrange an agreement and contract with a suitable investor. Planning and realization of the solar power plant. Secure the lease payment from the investor. Maintenance and monitoring of the solar power plant. A Division of InvestBank Corp.